Last month I gave a short presentation about unionism and the UFT to a group of teachers, many of whom were incoming Teaching Fellows. At one point during the question and answer portion of the event, the topic of divisions (real, imagined and provoked) between veteran and new teachers came up. There was wry acknowledgement of the false stereotypes and caricatures that are used to divide us: veteran teachers are jaded, lazy burn-outs who don’t believe in kids and are responsible for their failure, while newer/younger teachers are arrogant, know-it-all drinkers of ed reform Kool Aid, and crypto strikebreakers (as if a teacher strike is on anyone’s radar for the next political eon). In other words, it was the usual nonsense people say, and something that we could shake our heads over and laugh about. For years now, teachers, especially experienced and senior teachers, have been blamed for the “failed status quo” responsible for the frequent dysfunction of the public schools and the problems of their students. Classroom experience, once seen as highly desirable, almost overnight became a liability, and veteran teachers have become rhetorical and literal targets. Under Joel Klein, the school budget process was changed to penalize schools that might be so foolish as to hire veteran teachers, and created incentives for hiring inexperienced one’s, who are cheaper, more vulnerable and presumably more compliant. Meanwhile, newer/younger teachers, while glorified in the media and by management, in practice are beaten down at least as badly as their senior colleagues. Achieving tenure now resembles a desert passage, as the DOE pressures Principals and Superintendents to postpone granting it, and it can be a five year ordeal. Newer teachers are also stuck in new pension tiers that discriminate against them, relative to their senior colleagues. The entire system is being purposefully re-configured so that fewer and fewer people receive tenure, let alone a pension. The election of Bill De Blasio and naming of Carmen Fariña as Chancellor was supposed to at least change the way DOE management looked upon and interacted with teachers. The open contempt that Michael Bloomberg habitually expressed toward us was to be a thing of the past. After all, Ms. Farina was a real educator, and promised to bring “joy” – a buzzword that even Arne Duncan has recently picked up – back to the classroom. (That she also promised to “sell” the Common Core to teachers and parents was not given the same prominence). But now we know that the Chancellor is going around telling new teachers that only “whiners” are in the teacher’s lounge. We know that she is telling the Daily News (8/31) that ATRs will disappear “… as principals are taught best practices for writing up teachers and beginning the arduous termination process” (which for ATRs is not arduous at all - MF). I always thought “best practices” were successful teaching and classroom management strategies, not paper trails and DOE lawyer hit squads. Does that make me a whiner? Suddenly, the widely reported fact that PS 6 had eighty percent staff turnover when Farina was principal doesn’t look quite so benign, if it ever did. Oh, and she was Deputy Chancellor under the Lord of Darkness himself, wasn’t she? 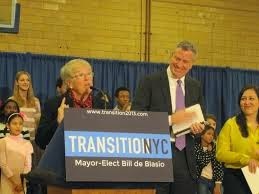 Possibly worst of all, and suggesting that De Blasio either is suffering from Stockholm Syndrome or that he promised something he wasn’t willing to fight for with his campaign rhetoric about charters, is finding out that the Chancellor sits on the Board of the New York City Charter School Center. The NYC Charter School Center says that its mission is to “… help new charter schools get started…” and that their work involves “Foster(ing) a favorable public policy environment.” In less delicate terms, the Chancellor’s name and reputation are being used to lobby for ever-more money for charter schools, and eventually a raising or elimination of the charter cap. That would further undermine the UFT contract, and negatively affect all future teachers, some of whom might now be students now in those very same charter schools. Additionally, as we all know, charter schools are famous for the enviable working conditions their teachers enjoy, as well as the “joy” their students feel as they march silently down their hallways , on their way to becoming “little test taking machines.” Then there’s all the additional funds charters bring to neighborhood public schools. Some of the Chancellor’s fellow Board members at the Center include such friends of public education as Geoffrey Canada, he of the expelled classes and half-million dollar a year salary. Also on the Board is Spencer Robertson, a Wall Street scion whose family foundation promotes charters and who sits on the Board of charter schools that have aggressively coveted and taken over public school facilities. So-called reformers will keep repeating, and the Chancellor will perhaps be obliged to affirm, that charters are public schools, but the reality is that they are not: they are private entities, privately controlled and managed, that receive public money. They undergo minimal public oversight, and do not serve the same populations as the public schools they siphon money from. Chancellor Farina has said and done some good things. Changing Chancellor’s Regulation C-30, so that non-educator’s can no longer be made principals and APs is an important rollback of one of the many terrible things Bloomberg did (assuming it’s not undermined by the waivers it provides for). So, then, what is the Chancellor doing on the Board of the New York City Charter School Center? Why is she boasting of “best practices” to harass and fire ATRs, rather than re-integrate them back into the schools? Why is she telling new teachers to stay away from their colleagues? Maybe I’m just a whiner, but I’m not feelin’ the joy.